The vastness, the silence, the towering Dolerite columns, sweeping vistas across arid plains and The Valley of Desolation are must-sees for this region. The gem of the Karoo is South Africa’s fourth oldest town Graaff-Reinet – a heritage nerve centre with more national monuments than any other city in South Africa. It also boasts the world’s only other Agave spirit distillery – South Africa’s answer to Tequila – outside of Mexico. The fame of the tiny village of Nieu Bethesda, off the N9 motorway, rests on the legacy of the eccentric artist Helen Martens who decorated her mystic sculptures and home with crushed glass. Her personal story and creations inspired the film The Road to Mecca. 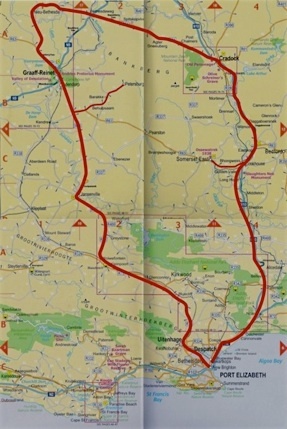 Depart PE and travel via Uitenhage and Jansenville over the plains of the Camdeboo. Visit Wheatlands Mohair Fam then a game drive at Mount Camdeboo Private Game Reserve. Travel to the 200-year-old Boer town of Graaff Reniet to visit the historic buildings such as Reinet House, the fossil museum, Urquhart House and Groot Kerk and SA Mohair offices. Visit The Valley of Desolation outside the town and enjoy a sundowner between the dolerite pinnacles inside The Camdeboo National Park. Overnight Heather’s B&B or the Drostdy Hotel. Leave Graaff Reinet for Nieu Bethesda. See the Owl House then go to Ganora Farm and see Bushman rock art plus British soldiers’ engravings from the Boer War. Visit the Mountain Zebra Park on the way to Cradock. Tour Cradock, including Olive Schreiner’s house and the Cradock 4 Gallery then overnight at Victoria Manor or Tuishuise, a row of renovated houses from yesteryear. Travel to the unusual Witmoskloof Oxwagon Camp for a mohair experience then on to Golden Valley for Tea. See Slagtersnek Monument and travel to Somerset East to view art works and Museum. Then on to Kamala Game Reserve. Game drive at Kamala Game Reserve. Return to Port Elizabeth to visit Cape Mohair.